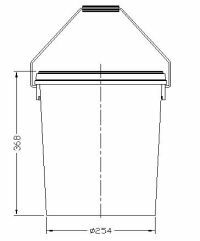 Plastic pails are suitable for packaging, storing and transporting of most types of liquid substances. Most common use is in the field of food and food additives, detergents and water based paints. The pails are designed for best fit on standard "Euro Palettes". The pails are designed for perfect fit for stacked one on top of the other.